This exhibition of painting, sculpture, ceramics, photography and video is for the curious and open-minded, for people of all faiths and none. It is bursting with richness and diversity, vulnerability and exploration, colour and fragility, treasure and beauty. his exhibition of painting, sculpture and video is for the curious and open-minded, for people of all faiths and none. It is bursting with richness and diversity, vulnerability and exploration, colour and fragility, treasure and beauty. The 40+ featured artists care about our world and the life it sustains. Their persistent probing to find meaning and understanding through what they create is hugely important to us all. 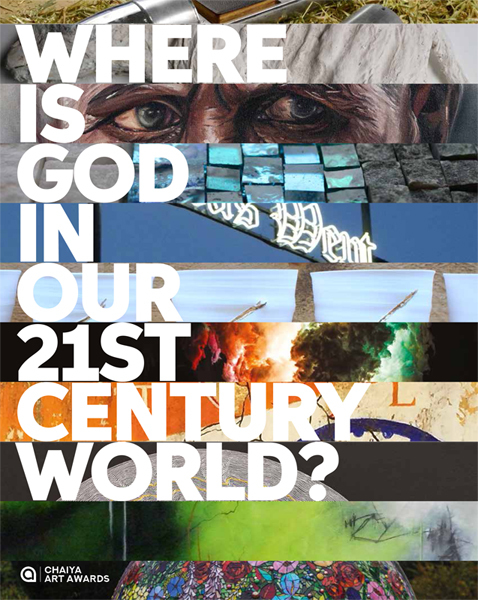 Be inspired and challenged by a multitude of original and provocative responses that will draw you further into the mystery of just where is God in our 21st-century world. Curated and Juried exhibition showcasing over 40 artists. Art for sale. Free Admission. Open 11am – 6pm daily and late night Thursdays till 8pm.